I love fruit crisps. The warm juicy filling and the crunchy oat topping relax me like no other food can (not even chocolate). They come together so quickly and are pretty much guaranteed to turn out. I really can’t think of anyway I could mess this up. Yesterday Janice my bother and I painted my kitchen, bathroom and all the hallways. It was a pretty big job but we got it all done in a few hours (thanks again guys!). Today I want to relax and enjoy the new clean white walls. Part of my relaxing day includes a crisp for breakfast using a Food and Wine recipe from this months magazine. Their recipe calls for nectarines and plums, but the nectarines I have are not quite ripe yet so I swapped them out for pears. The recipe also calls for less sugar than a typical crisp and uses a mix of whole wheat and all-purpose flour to make it a little healthier. It also calls for a butter oil blend instead of just butter, however I just cut back on the butter a little. I left out the orange juice called for only because I don’t have any. I also halved the recipe because I could easily eat an entire crisp in one sitting. The healthy crisp was definitely just as satisfying as my usual full fat/high sugar version. The ripe fruit provides plenty of sweetness, and there was just enough butter to keep the topping crisp and delicious. 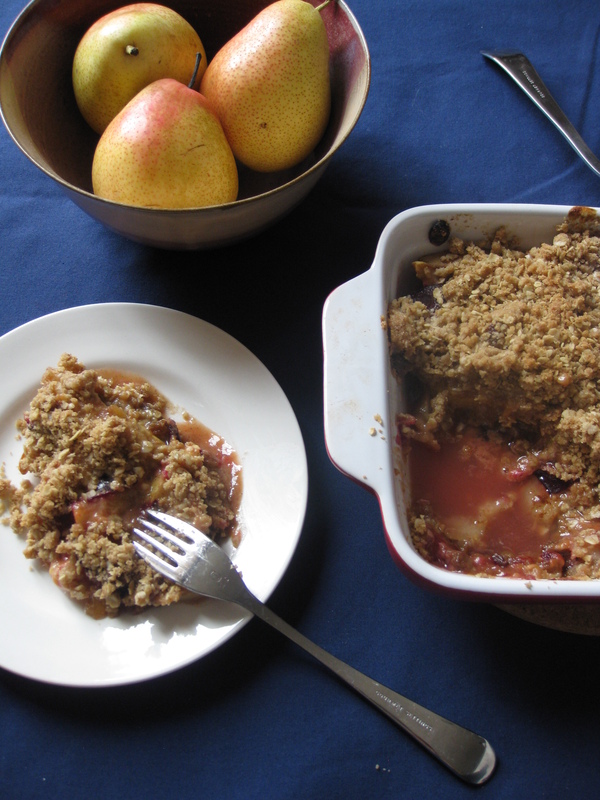 The plums also provide a little hit of tartness that is a very nice contrast to the sweet pears. The only thing I might add in the future are some nuts to the crisp topping for a little extra crunch, I think pistachios would be perfect. Make filling; combine all filling ingredients in a large bowl. Toss gently to cover the fruit completely. Make topping; Put all ingredients in a large bowl. Using your fingers or a pastry cutter, combine butter into the flour until it has a crumbly texture. Pour filling into a 4 by 4 inch dish. Cover with topping. Since this is one of the many magazine recipes I want to make, I’ll be submitting it to Cream Puffs in Venice for Magazine Mondays. I always make crisps for dessert and eat the left-overs for breakfast. Making if for breakfast is brilliant! This looks like a great end-of-summer/pre-fall breakfast! And it’s nice to know that you can use a little less butter in a crisp topping and still get the desired results. Fruit crisps are so addicting. I love that you’ve made this one a bit healthier than most. I’m always tempted to have them for breakfast- they’re fruit, right? Thanks for the lovely recipe. Your fruit crisp would not be safe on the counter in my kitchen, this is probably one of my favorite things to eat, seriously. Out of 100 recipes on my blog, half are for crisp topping, it’s ridiculous but true. Your recipe sounds delicious and thanks for making it a bit more healthy than the regular full butter amount I’ve been known to use:-) I’ll give it a try soon, thanks again. YUM! There’s nothing like a warm crisp out of the oven! I love crisps as well…the peach and plum fruit combination sounds delicious in yours! Nice job on all that painting. I love painting…it makes everything feel clean and new. I’ve been itching to paint our master bedroom lately, but reluctant to do so before it’s cool enough to open the windows and let in some fresh air. Beautiful combo of pear and plums. I’m dying to make a crisp, I never tried it before. It always looks so delicious, bubbly and crunchy. Yummmmmm. I love crisps and this one is gorgeous. Fab!! You did amazing, this looks incredible! Crisps are in my top five favorite desserts. Love the fruit…..makes me feel I am eating healthier. Great post! this looks not too sweet, which is how i like things. i might have to try it soon. love crisps! Thanks for stopping by! I’ve emailed you this post. If you would like to recieve all my posts, click the Email Subscription button on this page.